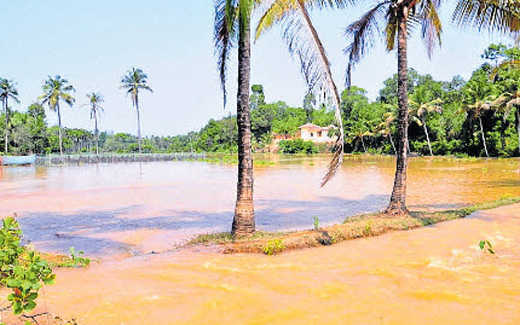 Kundapura, Mar 17,2017 :Reports indicate that residents were shocked to see their fields inundated in the morning on March 17, Friday.The 26-km long canal of Varahi irrigation project breached at Keyyadi Kela Hebbagilu at Molahalli Gram Panchayat near Kundapura and water entered into the agricultural fields and houses. Standing crops have been damaged. The surrounding farm lands with over 200 banana plants and more than 1,000 arecanut plants was found damaged. More than 100 acres of farm land has been flooded. The residents of Basabailu said that they incurred a huge loss following a breach in the canal two years ago. The compensation for the loss was not distributed properly it is claimed. Inspite of water entering the farm land, the officials from Varahi project have not visited the spot to assess the damage, the residents complained.